Eric Smith's portrait of his dealer, gallery owner Rudy Komon won the Archibald Prize for 1981. 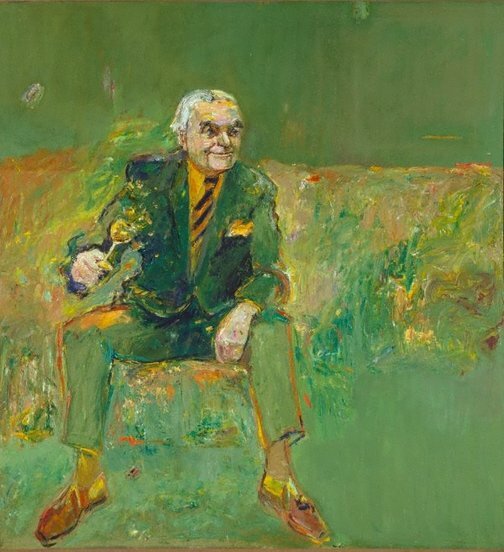 When it was discovered that there were similarities between the winning portrait and a photograph of Komon dating from 1974, artist John Bloomfield, whose 1975 award had been withdrawn on the grounds that his portrait of Tim Burstall was painted directly from a magazine photograph, subsequently sued for the return of the prize. The case was dismissed on 23 September 1983. Peter Ross, 'Let's Face It: The history of the Archibald Prize' 2005, pg. 147. This work was acquired by the Gallery in 1982. Signed and dated top c. verso on frame, black fibre-tipped pen "... 1981 ERIC SMITH ...". Anna Waldmann, Art and Australia (Vol. 20, No. 2) , 'The Archibald Prize', pg. 213-236, Sydney, Summer 1982, 236 (colour illus.). Let's face it: the history of the Archibald Prize , ‘Chapter 4: Into the 1970s’, pg. 61-85, Sydney, 2005, 79, 80 (colour illus.) 81, 82, 147 (colour illus.). Let's face it: the history of the Archibald Prize , 'Into the 1970s', pg. 63-87, Sydney, 1999, 82 (colour illus. ), 137 (colour illus.). 52 views of Rudy Komon , Sydney, 1999, 59 (illus. ), 60 (illus. ), 73 (colour illus.). NOTE: black and white photograph on page 59 and 60 of Komon during 1974 Anniversary Show is similar pose. The Archibald Prize 1921-1993 , Sydney, 1993, 26 (colour illus.). The Archibald Prize: an illustrated history 1921-1981 , Sydney, 1981, 236 (colour illus. ).